Yes, you can take perfect photos with your smart phone or tablet. This is because the quality of the shot is not about the type of device you use, it’s about technique and what you include in the shots. The elements of an excellent photo are things like good natural lighting, but you should be most concerned about including all the details. Your photos don’t need to be perfect but they do need to include the features of every wall, and any obstructions like soffits, pipes, heaters, etc. We depend on your photos but we certainly won’t judge their quality, we just need the details. Here is a post on this very topic: 5 Must-dos Before You Take Photos of Your Kitchen for IKD. With any kitchen design, accurate (and detailed) measurements are extremely important. So, don’t just measure the length of the walls, take a close look at your kitchen. Are there elements that might alter measurements (exposed beams, decorative moldings, unprotected pipes)? These architectural details need to be included, so take as many pictures of these as you can. If you have not selected new appliances it’s going to be hard to fit them into your design space without details on what currently fills the space. For a painless design process we recommend including measurements of the appliances you currently own. We can use those to start your draft and use specific measurements of your future appliances later (with revisions). Think about your refrigerator, sink, microwave, etc. 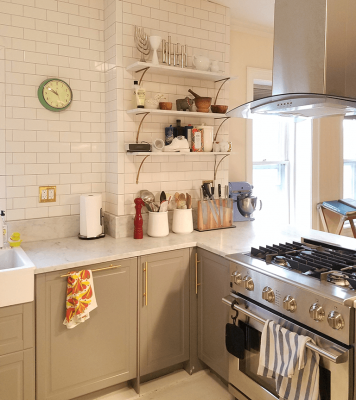 These appliances come in many different shapes and sizes, so we need to know the details of each—brand, model number, and measurements. During this process remember that we want to see your kitchen ideas, and this might be the best time to think about it. 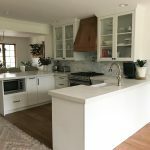 So, while you are writing down all these details about your kitchen, think about the styles you might love and begin to visualize what you want. Our customers often send us website links, photos, drawings and sometimes they even send Pinterest idea boards. So please send us samples of kitchens you love and we’ll take them into consideration for your design. With all her kitchen tools and utensil and little room for top drawers, Brooke needed storage and lots of it. So she decided on a drawers-within-drawers option for her new IKEA kitchen. She now has the enviable problem of trying to fill all the empty drawers in her kitchen. Bryan and Rachel are serious chefs that entertain so they needed a highly functional kitchen. The end-result of our design was a kitchen work triangle. A space where the cook top, refrigerator, and sink were close enough but not too close, for the most efficient space possible. An ideal IKEA kitchen renovation for serious chefs with style. Justina was looking for an Italian-style IKEA kitchen large enough to cook and entertain. A space where friends and family could mingle but stay out of her kitchen workflow. So this design features a peninsula where guests can chat with her and even pull a bottle of wine from the wine refrigerator. Nice setup, right? What about you? Are you a foodie? Do you have a prized set of knives on display, a large mixer, and many pots and pans to accommodate? Do you entertain, and need a large space to play host or hostess and socialize? When it comes to using your kitchen, we all have our own way of doing things. So don’t just think about the amazing kitchen you could have (see step #4 above) think about it as a functional space built for you and your cooking/entertaining style. Finally, take a second (and third) look at all of the information you’ve collected (photos, measurements, plans, ideas, etc.). Remember, we don’t need photographs that will go in Architectural Digest. These are your “before” shots. Take quality shots but don’t get carried away. We won’t judge. Make sure you are looking at this with fresh eyes, so focus. You’re so used to your kitchen—and what you do in it—you might forget the details. So, have a new perspective when capturing all the information. Remember not to overlook the details—vents, plumbing, any other architectural details. So, you’ve gone through these six important steps for a quick and painless IKEA kitchen design process. You’ll soon have a high-quality rendering of your IKEA kitchen design and your shopping list. And best of all, you are well on your way to the kitchen of your dreams. 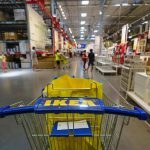 Are you ready to design your IKEA kitchen? Get started with with our premium package.